You can have a listing of "New Businesses Coming to Wake Forest" delivered directly to your inbox by signing up for E-Notifier. 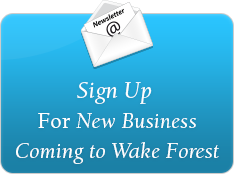 To enroll, simply click the icon, enter your email address and check "New Businesses Coming to Wake Forest." The service is free and you can unsubscribe at any time. Please Note: For more information about any of the "new businesses" shown below, please contact the Wake Forest Planning Department at 919-435-9510. Creating Better Days, 121 N. White St. Touchstone Bank, 1776 Heritage Center Dr.
Verizon Wireless, 11710 Retail Dr. Your CBD Store 706 N. Main St.
AK Designs, 710 N. Main St.
Marcos Pizza, 11712 Retail Dr.
Music & Arts, 12536 Capital Blvd. The Hideout, 1839 S. Main St.
Wake Forest Body Boot Camp, 2115 S. Main St.
Firehouse Subs, 11704 Retail Dr.
Nunzio's Tapas Restaurant, 110 S. White St. Alphabet Soup Educational Supplies, 225 E. Jones Ave.
Brandon Reece Insurance Agency, 1906 S. Main St.
Homespire Mortgage, 1772 Heritage Center Dr.
Full Armor Technology & Marketing, 1776 Heritage Center Dr.
Primetime Hockey, 1839 S. Main St.
Wild Birds, 13654 Capital Blvd. Wireless Research Center of NC, 3331 Heritage Trade Dr. Giant Bike Store, 11216 Capital Blvd. 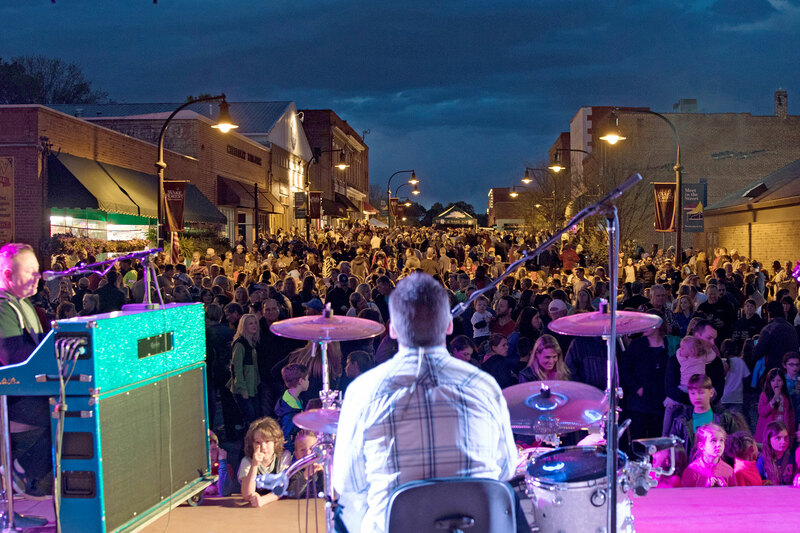 Noire The Nail Bar, 11702 Retail Dr.
Alexander Heating & Air Conditioning, 5107 Unicon Dr.
Alpha Management Community Services, 1772 Heritage Center Dr.
Prime Mortgage Lending, 1780 Heritage Center Dr.
Veronica's Doggie Delights, 2008 S. Main St.
Well Bean, 4154 Shearon Farms Ave.
RPM Media, 1780 Heritage Center Dr.
Brios Media Group, 1768 Heritage Center Dr.
Heritage Title, 1776 Heritage Center Dr.
Chipotle Mexican Grill, 11700 Capital Blvd. Renegade Motorcycle, 300 Wait Ave. Spoke Cycle Bicycle Shop, 417B S. Brooks St.